My card is somewhat inspired by this beautiful creation by Delys Cram, who is one of the very talented Just Add Ink design team. Thanks for the inspiration Delys! Accessories: Chit Chat rub-ons, 5 Petal Flower punch, D'vine Swirls Cuttlebug Folder, Distressed Stripes Cuttlebug Folder, Tiny Bubbles Cuttlebug Folder, Dimensionals, Sticky Strip and SNAIL Adhesive. This was a fun card to make. I really like making little scenes on my cards. It is so much fun seeing how life-like you can make them appear. Thanks so much for visiting my blog, and thank you for all of the lovely comments that you leave. You make my day! (Blogged to: The Rhythm of the Night - Corona). Fabulous card Sam. Love the bright colours and all the different elements you used to create it. Nothing more I can say but ABSOLUTELY BEAUTIFUL!!! Just love it Sam you clever cookie you!! Ooooh that so clever. Still haven't worked out how did the upside down ele in the water though. Looks gorgeous Sam. I feel sorry for the little fella too!! Love your card Sam and thanks for the lovely comments and linking to my blog. Youve inspired me to use that stamp set again..havent had them out for awhile! 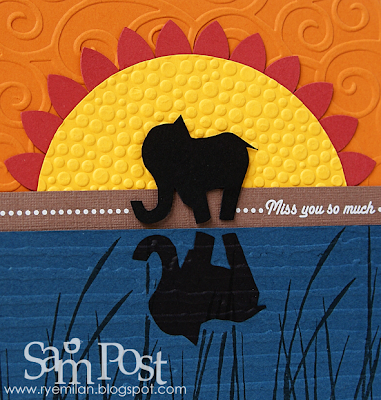 Well done Sam ... this is terrific, I love your scene image ... the colours and the elephant are soo Africa ... love it!!! What a vibrant, fun card. Great take on the sketch. OMG Sam, you are on fire girl! Your cards are spinning me out! WOW Sam - this is truly stunning!!! 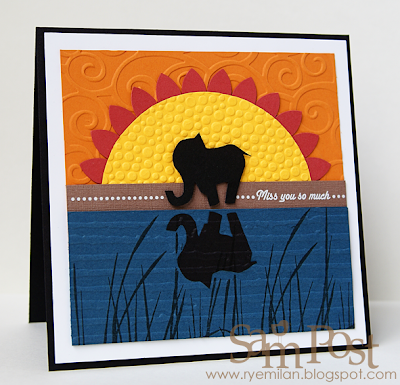 Your wonderful bright colours and all that embossing - and then the elephant in silhouette - amazing job! I can alost hear the African drums beating over the Savannah! Hi Sam, you continuously blow me away with your gorgeous creations. Thanks for playing at Just Add Ink. Oh a great card, and those colours are so bright, they are terrific. Wonderful Sam - so bright and creative. Great inspiration. One word Sam...STUNNING, love it!!!! clever and bright! i love it! I love this card - you are a clever cookie!!! !